Saturday, July 12th, was my second youngest sister’s birthday. Laura turned 15, and two days before, my youngest sister, Jackie, turned 10. What way to celebrate other than a whole day out in New York City? And I mean a whole day. art on Kanye West‘s last album and the cherry-covered Louis Vuitton bags. The exhibition as a whole was pretty eye-popping and funky and a bit freaky, something I’m glad we’d seen before it’s closing the next day. Here’s an example of Murakami’s SUPERFLAT art. See the flowers below the actual canvas? 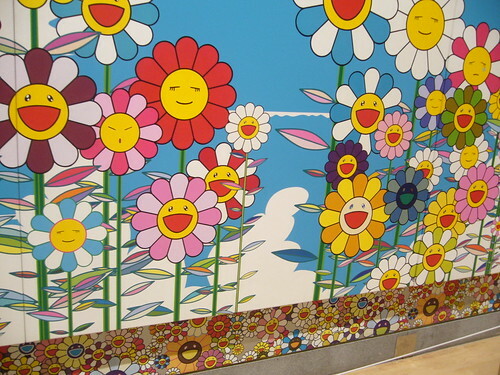 Well, entire walls were covered in those psychedelic happy flowers. Let’s just say I was a bit dizzy by the end. From Brooklyn, we took the 4 all the way up to 59 and Lex where Laura and Jackie went gaga over the treats at Dylan’s Candy Bar. They’ve just finished renovations, and now the lower level is exclusively for candy while the upper level is a full-out ice cream, frothy drink cafe. Afterwards, we walked down to 5th where Laura wanted to see the cubed Apple store (there were droves of people waiting in line for the new iphone so we didn’t actually go inside) and amused ourselves in the Ugly Doll section of FAO Schwarz. Other stops included the Disney store (Jackie went beserk when she saw the Jonas Brothers window display), Henri Bendel, and Takashimaya, until we finally decided at 2:00 PM that it was time to eat and randomly chose Papillon. Papillon was a mediocre “bistro” with the usual French dishes such as French Onion Soup, foie gras pate with greens, etc. 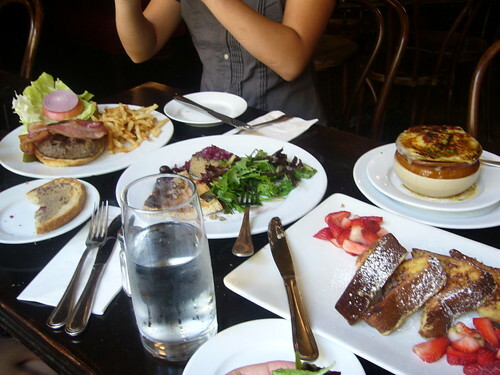 Since it was brunch time, we also got brioche French toast (my favorite of the dishes), and a disappointing burger that lacked tenderness, salinityand flavor. I could’ve been eating a chew toy. Well, I guess you win some, you lose some. Walked around a bit more until we got to Rockefeller Plaza, where I dragged the two kiddies to La Maison du Chocolat to FINALLY try one (well, three) of their famous macarons. Is there anything more delicious? These really are the best macarons I’ve had in NYC – the almond meringues on each had the desired crispiness at the initial bite, yet the insides were soft and slightly chewy and went well with the healthy dose of the filling (Financier macarons don’t have enough and that bothers me a bit). My personal favorite was the chocolate and tea. There was a hint of raspberry that lightened the richness of the chocolate, perfect complements to one another. The coffee was delicious, and the caramel a bit too rich and sweet for me, but it was just plain wonderful to finally eat even a single one. We ended our day out by shopping in Soho. I stopped at Vosges Haut Chocolat to pick up a couple chocolate bars and we looked around the MoMA store to see if there were any interesting gadgets on sale (usually it’s way too pricey for us). But most importantly, we had to eat noodles for dinner. 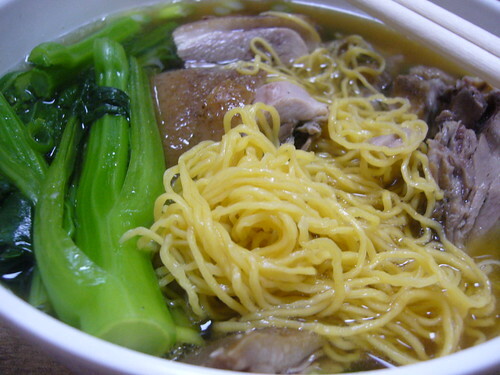 It’s a Chinese tradition to eat noodles on your birthday because the food symbolizes long life, and we went to our family favorite – Bo Ky.
Just simple, duck and mushroom noodle soup at an unbelievably low price. Flavorful broth with condiments on the side that you can add to your heart’s delight, tender duck, and a helping of Chinese broccoli and mushrooms. Comfort food at its finest and a wonderful meal at the end of a very long and jam-packed day. We went home quite happy. So there you have it, another long day in the best city in the world. I’m biased it’s true, but after this post, how can you not think it so? Wow. What a day. Admirable discipline with those macarons, lining them up half-eaten for a photo…I would probably have scarfed them. Haven’t tried Bo Ky, will have to visit. My current favourite noodle place is Big Wong King (http://nymag.com/listings/restaurant/big-wong-king/)–for $4.75 you can get a bowl of noodle soup with bbq pork AND a whole roasted duck leg, and the meats always of the best quality. Have you been there? Michele – I wanted to down those macarons in one bite each, but I had to take pics of their insides first! I’ve heard of Big Wong King, may have even been there before with my parents a couple years back. I’m guessing it’s a branch of Big Wong’s with the delicious spare ribs? Anyhow…looking at the link you gave me, this place is at the TOP of my to-eat list now. Thanks! I love La Maison du Chocolat’s chocolate eclairs, so deep dark and luscious and yet they are like eating air! What a fun trip though! Tartelette – I saw those and seriously considered buying a bunch to take home with me, but my willpower remained intact. Will have to try them next time. I’m glad Dylan’s renovated. It was starting to look dirty. I now need to go to La Maison for those macaroons. mmm bo-ky is one of my favorites too!!! Bonbon Oiseau – Yay! I’ve gone to it for so many years now and I haven’t been disappointed once. Though, that’s probably because I always get the same thing. dhanggit – Murakami = pop art master. not sure if you saw, but the entry afterwards features loads of pictures from the exhibit. feel free to check it out! PS. chances are you won’t see them anywhere else, photos were forbidden. but i was slick! Wow, this is a loaded post! I really want to go to that candy store. That’s amazing. Hiii Becky! The macarons almost look too pretty to eat – almost, hahah. How have you been? Doing anything special for NYC Restaurant Week? WOW…long post indeed & very very delicious. 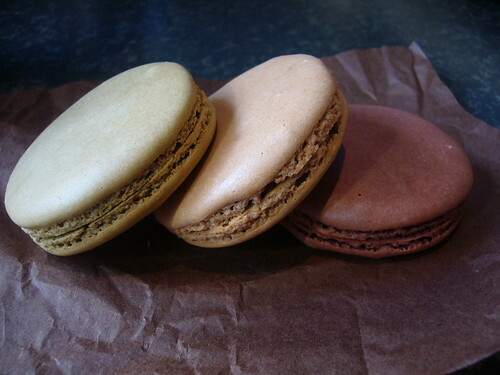 I need a jelly in my belly…followed by those scrumptious looking macarons! YUM!! Emiline – Dylan’s with the renovation IS amazing. The only thing I regret is the loss of the candy timeline that wound around the entire first floor. Still a wonderful place to visit though! Anne – I’ve been good! NYC restaurant week is gonna be busy for me, I’m going to Fleur de Sel, Union Square Cafe, Lure Fishbar, and Wildwood BBQ. How about you? Deeba – Yah. But there was so much food content I had to share it! Katy – I’m thinking I might just buy a giant stash before I go back to school. And label it EMERGENCY MACARONS – though they’ll probably disappear within the first week. Oh my! So much deliciousness! I am drooling. You are currently reading Warning! Long post: Dylan’s, Papillon, La Maison du Chocolat, and Bo Ky at Notes on Food.